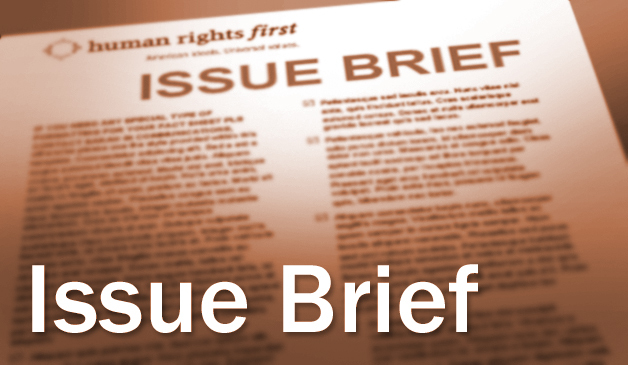 Human Rights First urges the U.S. Government to address flaws in the immigration detention system which have led the United States to fall out of compliance with the obligations it assumed when it ratified the ICCPR on June 8, 1992. This document outlines three areas of U.S. noncompliance with the ICCPR as it relates to the detention of asylum seekers and immigrants, including i) the lack of prompt review by an independent court of the decision to detain; ii) the lack of an individualized determination of the need for detention and the failure to provide periodic review; and iii) detention in jails and jail-like facilities that are not appropriate to an asylum seeker or immigrant’s status as an administrative, not criminal, detainee. For each of these areas of noncompliance, Human Rights First offers a corresponding recommendation that the United States could adopt to bring its laws and policies better in line with its obligations under the ICCPR.